The subject of this profile is another one of Oregon’s very own, and he is as talented as they come. A big-bodied lineman, Voeller is considered to have great speed and strength. He’s a high-powered run blocker who can easily punish defensive linemen. His skill on the field comes from spending five years at the legendary line coach Brian Derby’s camp in his youth. Voeller has already made it into the ESPN Top 300 lineup, and this four-star recruit was both the No. 2 recruit in Oregon (after Thomas Tyner) and the No. 9 offensive guard in the nation. To add to that list of accomplishments, he made First-Team All-Three Rivers League in 2011 and 2012. Voeller played as a tackle through his high school career, but he can also play the guard spot. This 6’5, 278 lb. offensive lineman was a participant in the 2013 Under-Armour All-American Game, only one of two Oregonians selected. He was also nominated as a finalist for the Army All-American Game. Although a shoulder injury his junior year hampered his playing time, Voeller had done enough by his sophomore year to make an impression on prospective colleges. To prove that, Washington State offered him a ‘verbal scholarship’ offer his sophomore year. All of Voeller’s hard work was rewarded. Virtually every Pac-12 team offered him a spot in their programs. As he whittled down those prospects to his top five, the real choice was made that much easier. While Stanford, UCLA, California and Washington put up a good fight, Oregon was always the one. Another factor was the opportunity with the Ducks — their facilities, their style, their legacy. Voeller simply wanted to wear the green and yellow. But he wasn’t always destined for Oregon. In fact, he wasn’t even a fan until his brother Dallen Voeller became a walk-on tight end in 2010. Though Dallen’s career with the Ducks was short lived, Voeller’s passion wasn’t. Although Voeller redshirted last year, he received a lot of positive reviews for his contributions to the scout team. This year, he hopes to make it on the offensive line rotation. Voeller anticipates his family coming out to games like they did with his brother. 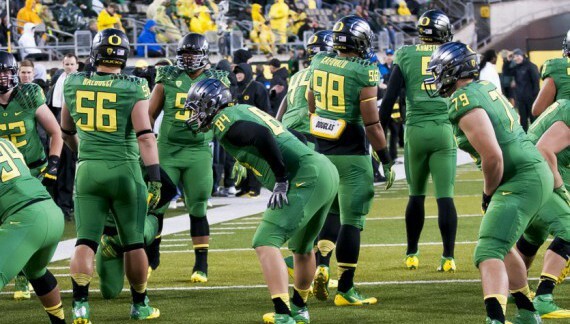 I look forward to seeing what he can bring to the Ducks’ talent-packed offensive line. His actions thus far tell us he’s ready and willing to do what it takes to make this a national championship year. Only 16 more days until we see Evan Voeller in action with the rest of our men in green and yellow. Go Ducks!